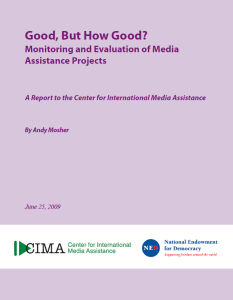 While media assistance boomed in the 1990s, few of the so-called “media missionaries” stopped to do the grunt work: monitoring and evaluation. Since then, donors and implementers in the media assistance field have shown a growing appreciation for the importance of M&E, and it is now no longer an afterthought. The media assistance community now values the practice as an essential part of any project, starting even before a program’s launch. While no two organizations in the sector have precisely the same M&E terminology and methods, they do share a number of tools, techniques and approaches. This report argues that they could share much more.